PokerStars has just announced a new live tour for the UK and Ireland, called UKIPT (UK and Irish poker tour), kicking off this December in Galway. I’m very excited about the whole thing - I’ve been jealous of the LAPT and APPT for years; now we have our own local series of live events. Brilliant. Plus there’s a leader board with extra bonuses: a $10k freeroll for the top 100 players, and (for the ultimate winner) buy-ins and hotel expenses for the WHOLE of season two. You can find out more about the locations and details here. But let me just say this. 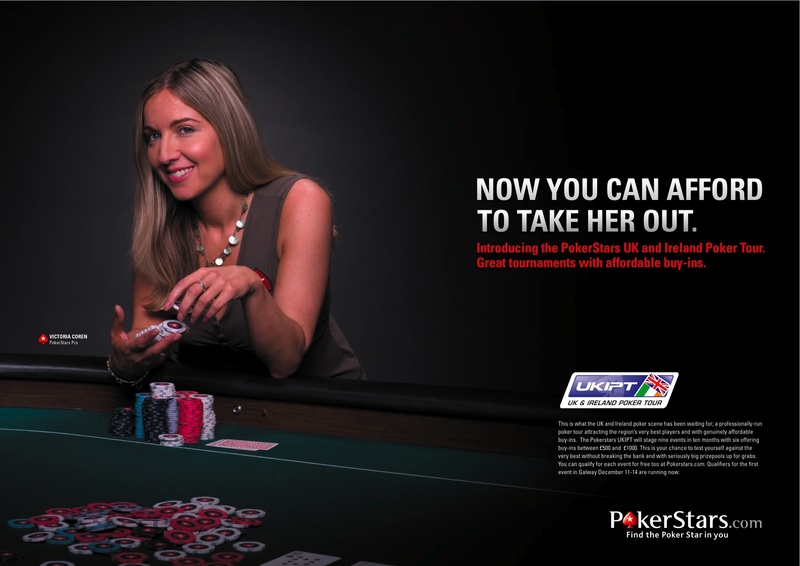 Today, PokerStars sent over the following advert which they’re planning to use for the tour. Fine. Not a bad joke at all. Except… hang on… the particularly brilliant and noticeable thing about the UKIPT is that the buy-ins are CHEAPER than normal. I like that: it’s about time we had some serious title events round here with buy-ins starting at £500. From the straightforward poker point of view, yes, yes, now the good recreational player can afford to play these significant tournaments while the EPT might be a bit of a stretch. But then.. that makes the pun.. that I am, basically a cheap date. Once the bankroll has shrunk, then, THEN you would think about taking me out. Marvellous. They’re not wrong *sigh*. Cheap date? I don’t understand this idea. I think the UKIPT is a great idea. With all the 10k events the thing poker needed was to have cheaper buy-ins to boost the flagging tournament numbers. The WPT did something similar and they got record numbers. Wonder which UK star comes out from this poker tour? I followed the link to the location map and found that Scotland is a town in a sparsely populated area of north Britain. Most educational. I can’t read the small text on your image, but I think the pun in “Now you can afford to take her out” works on quite the opposite assumption - that you’re NOT a cheap date, and therefore most men couldn’t afford to take you out (on a date). But now with cheaper buy-ins, an ordinary punter can afford to take you out (of a tournament). Except, of course, you’re a reasonably proficient player, so that ain’t gonna happen. Which is how all advertising works, I guess. If you’re convinced, I can be found on 0778…..
Not how the pun reads to me. Surely the joke is that a lowly peasant such as myself wouldn’t stand a chance with a millionairess like yourself (in terms of say, a date) whereas with these low buy-ins I can actually afford to buy in to the tournament and attempt to knock you out (‘take you out’ in the knock-out sense). Makes you sound a reet classy broad I reckon. I had just assumed that that was the case…....... oops! Excellent advert. Poker seems ever more popular & for some reason especially men are lured towards it - can’t think why ! Definitely time I ditched chess and learned how to play your more glamorous game, with its rewards! I’m sorry, but are you saying you have to pay £500 to play? You’re saying that’s cheap?! Good lord, how much does it normally cost? Are you normally that orange, or are the photoshop people at Stars extremely fond of adding glow to images? laughed, cried, sat on the edge of my seat, fell off, got all nostalgic for pokah, punched the air and collapsed on the sofa. it works on every level. Not completely relevant to the blog above, but I just finished your book and adored it - cried with equal strength for the loss of your father and your bad beats, smiled at the wryness with which you balance addiction and normalcy, and tried to explain my chuckles and tears to my husband who’s never sat through a game of cards. For a Canadian who fancied herself a Holdem player in university in the late 90’s, this was a welcome dose of nostalgia alongside deft observation of the poker-life parallel. Extra special thanks for the Alice in Wonderland references. Thanks Adam & Andrea, those are really lovely messages and I appreciate them very much. As you’ll have seen, the book is extremely personal, so I’m very sensitive about it and it’s incredibly reassuring to get such very nice feedback. I’m worried about the name of the tour. UKIPT is far too similar to UKIP for my liking. I guess it could be worse.. They might have called it the British National Poker Tour. I had a vision… PokerStars jostling for motorway supremacy with the X Factor mega-bus. Stampedes at the services for Pot Noodle and chips; heated debates over who has the rights to the Xmas No.1; and, if nothing else, it’s bound to come to fisticuffs over parking spaces, entertainment validity, and who possesses the best bottom. Has anyone made a joke about vicky running her big pair into their nuts yet? If not could I please make the joke thanks. Anyway, would be nice to meet you in person one day. 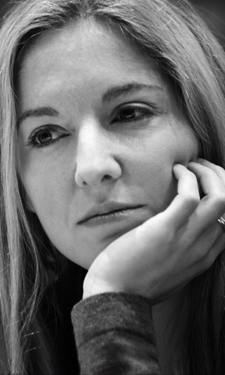 The UKIPT might make it possible…. shame there’s not more online qualifiers for these events, they all seem to be fpp and far apart??? ?